Did you know that the first medical library at Pitt was established in 1912? The library was located in Pennsylvania Hall, as was the medical school. (The original Pennsylvania Hall was demolished in the fall of 1998, and a residence hall was built on that site.) Mabel Crawford Burland was the first librarian and was paid $5 a month. By 1920, the library occupied two rooms in Pennsylvania Hall: one held books in current use and the other had stacks for older materials. From 1920-1938, the medical library was overseen by six different librarians. The library collection in the 1920s contained 3,600 volumes and a small number of current journals. In 1938, the library, along with administrative and faculty offices as well as most of the school’s departments, were relocated to Old Mellon Institute, now Allen Hall. Only the first year courses in anatomy and pathology remained in Pennsylvania Hall. Students remarked about the time they spent running up and down the hill between the two buildings carrying their microscope and slides. Also at the time of the move to Old Mellon Institute, the libraries of the School of Dentistry and School of Medicine were combined into one library. Alice McCann was the librarian of this combined library from 1938-1957. By the late 1940s, there was a need to move the medical school as well as the other health sciences schools into a better space. The School of Pharmacy was located on the bluff downtown, while the Schools of Dentistry and Nursing were in various locations across campus. The Senior Vice Chancellor envisioned a building that would house all the Schools of the Health Professions. One of the first donations for this new building was $300,000, from the Maurice and Laura Falk Foundation, for a new medical library. In 1957, classes began in the new Schools of the Health Professions building, later renamed Scaife Hall. Carroll F. Reynolds, PhD, was the first director of the Maurice and Laura Falk Library of the Health Professions from 1957-1975. By 1960 Falk Library received 1000 current journals and included approximately 100,000 volumes. 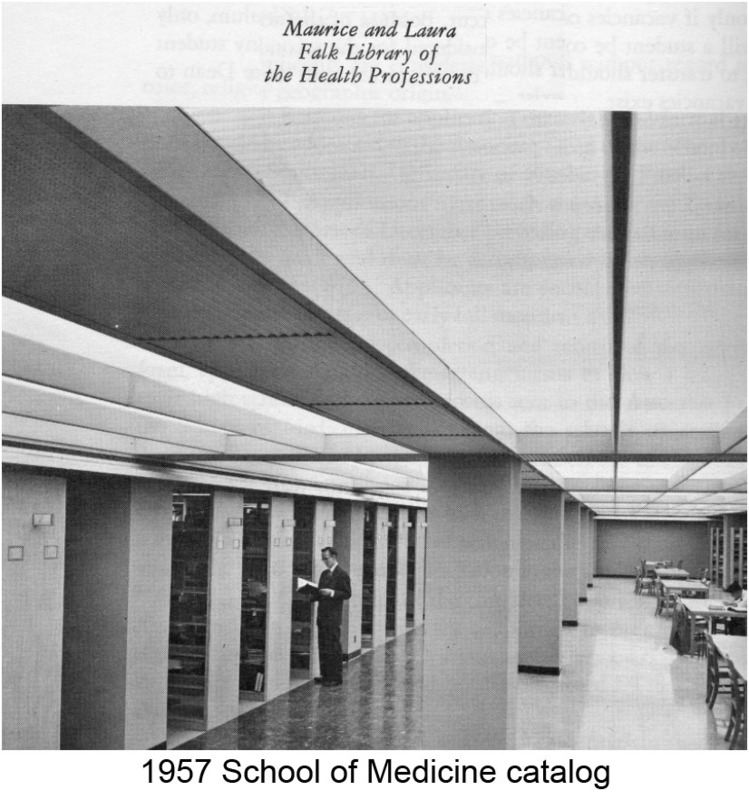 Falk Library was awarded a National Library of Medicine grant in 1967 to supplement the library’s operating budget. Laurabelle Eakin was the library’s director from 1975-1985 and Patricia Mickelson followed as director from 1986-2003. Barbara Epstein, the current library director, oversees a staff of 51 faculty librarians, technicians and paraprofessionals. This article is a summary of a presentation about the history of the University’s medical library. The full video presentation is available in two parts: Part 1 and Part 2.